Pulmonary surfactant is a complex mixture of phospholipids and proteins, which is present in the alveolar lining fluid and is essential for normal lung function. Alterations in surfactant composition have been reported in several interstitial lung diseases (ILDs). Furthermore, a mutation in the surfactant protein C gene that results in complete absence of the protein has been shown to be associated with familial ILD. The role of surfactant in lung disease is therefore drawing increasing attention following the elucidation of the genetic basis underlying its surface expression and the proof of surfactant abnormalities in ILD. The role of surfactant in interstitial lung disease (ILD) has drawn increasing attention in recent years, particularly with the publication of the genetic determinants of surfactant expression. This review will focus on surfactant abnormalities in ILD, with emphasis on surfactant protein (SP) gene polymorphisms. Pulmonary surfactant is a mixture of phospholipids and surfactant-specific proteins, which are essential for normal lung function. The main function of pulmonary surfactant is to stabilize the alveoli throughout the respiratory cycle, preventing alveolar collapse at the end of expiration. Surfactant-specific proteins are also involved in host defense and inflammatory processes in the lung. Between 90% and 95% of lung surfactant is made up of lipids, with the remainder being proteins. Roughly 65% of the lipid component of surfactant is phosphatidylcholine. The remaining 30–35% consists predominantly of phosphatidylglycerol, while phosphatidylinositol, phosphatidylethanolamine, phosphatidylserine and sphingomyelin are also present in small amounts. The surfactant-specific proteins are mainly composed of four surfactant-associated proteins: SP-A, SP-B, SP-C and SP-D, along with a minor component of mainly serum-derived proteins. SP-A and SP-D are hydrophilic, while SP-B and SP-C are highly hydrophobic proteins. Surfactant phospholipids and SP-C are synthesized only in the type II alveolar epithelial cells. The proteins SP-A, SP-B and SP-D are produced by Clara cells and type II alveolar epithelial cells in the lung. SP-A is the most abundant surfactant protein and is completely lipid-bound. It is a multimer containing the product of two genes: SP-A1 and SP-A2. SP-A and SP-D proteins are structurally similar collagenous glycoproteins belonging to the collectin superfamily. They are involved in host defense and recognize the carbohydrate moiety on the surface of pathogens. SP-B and SP-C are crucial in reducing surface tension by enhancing the adsorption and spreading of phospholipid at the air–liquid interface. Absence of SP-B production is lethal in infants and experimental animals . Several studies have explored the surfactant levels in bronchoalveolar lavage (BAL) fluid in patients with ILDs. More recently, serum levels of SPs have been studied and correlated with disease progression. Early studies of surfactant in the bleomycin animal model of lung injury showed significant alterations in the composition and biophysical properties of surfactant. Studies of phospholipid content of surfactant in BAL from IPF patients showed significant abnormalities, including reduced alveolar phospholipid, decreased content of phosphatidylglycerol and a reduction in the phosphatidylglycerol/phosphotidylinositol ratio . Gunther et al. studied the biophysical properties of the surfactant obtained from normal control subjects and IPF patients, and showed that the adsorption and surface-tension-reducing properties were largely lost in virtually all patients with IPF. McCormack and colleagues  hypothesized that the alteration in the surfactant lipid composition changes its biophysical activity, diminishes lung compliance and promotes lung fibrosis. Since SP-A plays an important role in the surface-tension-lowering abilities of surfactant, they measured the SP-A levels in BAL fluid. In addition to reduction in phospholipid content, SP-A levels were also significantly reduced in patients with IPF. The SP-A/phospholipid ratio correlated with disease course over a six-month period and with mortality. In a follow-up study, surfactant levels in BAL fluid were correlated with survival. The mean SP-A/phospholipid ratio was lower in patients with IPF than in healthy volunteers, and the magnitude of reduction was predictive of survival in patients at two years . Others have found a similar reduction in the SPA levels in patients with IPF but no change in SP-B or SP-D levels [1, 3]. Levels of SP-C in BAL fluid of IPF patients are not known. It is clear that there are alterations to the biochemical composition of surfactant in IPF. It is possible that these alterations play an important role in the progression of the disease. Whether the immunological properties of the SPs play a role in the development of the disease needs to be studied. In sarcoidosis, no substantial changes in surfactant phospholipid profile have been reported in several studies . However, conflicting results have been reported regarding SP-A levels. While van de Graaf et al. found unchanged levels of SP-A , others have found increased  or decreased levels . Although it is possible that the abnormalities may reflect different clinical stages of the disease, it is thought, in general, that sarcoidosis is not associated with major pulmonary surfactant abnormalities . In hypersensitivity pneumonitis, moderate changes in phospholipid profile with reduction in phosphatidylglycerol have been noted . While elevated SP-A levels have been reported in acute disease , both low and high levels have been reported in other studies [3, 6]. Pulmonary alveolar proteinosis is characterized by the abundance of periodic acid Schiff (PAS) material, which fills the alveolar spaces. In the adult form of the disease, the material is composed of glycoprotein and lipids. SPs A, B, C, and D are all increased in BAL fluid. While the phospholipids have been found to be normal, structural alterations in SP-A and SP-B have been described [8, 9]. Recently, Takahashi and colleagues reported the serum levels of SP-A and SP-D, and disease extent in IPF and lung fibrosis associated with scleroderma . In IPF, both SP-A and SP-D concentrations correlated significantly with the extent of alveolitis but not progression of fibrosis. As opposed to lower BAL fluid SP-A levels predicting poor prognosis in other studies, they found that the serum levels were higher in patients who died within three years when compared with patients who lived longer. In scleroderma, the serum levels of SP-A and SP-D were higher in patients with ILD (based on computerized tomography) when compared with patients without any interstitial disease [10, 11]. In summary, both lipid and protein components of surfactant can be abnormal in most ILDs, particularly IPF, and there is evidence to suggest that SP abnormalities may be related to survival in specific diseases. Are these changes genetic or do they merely reflect prior tissue damage? An understanding of the genetics of the underlying lung disease in general, and SP expression in particular, may be important in defining susceptibility to and progression of these conditions. The development of ILDs is thought to occur in genetically susceptible individuals, following exposure to a variety of potential environmental triggers. Support for a genetic influence in the development of ILDs comes from two types of observation. First, there is variable susceptibility to environmental causes, and second, familial disease has been reported in most ILDs, including sarcoidosis, IPF, alveolar proteinosis, Langerhans cell histiocytosis, hypersensitivity pneumonitis and desquamative interstitial pneumonia (see Supplementary Table 1). ACE, angiotensin-converting enzyme; IL-1, interleukin-1; NRAMP, natural resistance-associated macrophage protein; TNF, tumor necrosis factor. ILDs are relatively rare and susceptibility does not follow single-gene Mendelian patterns. They are referred to genetically as 'complex diseases'. Variations at multiple loci, each exerting variable and relatively small effects, are likely to be involved. Further complications in assigning susceptibility involve the assessment of interactions with environmental factors that are thought to induce a specific clinical phenotype, and the knowledge that interactions between genes and the environment can affect the relationships of severity and progression as well as predisposition to disease. Finally, some conditions, such as IPF, manifest in the later stages of life, making family-association studies difficult. For these reasons, most studies of the genetics of ILDs have applied the direct case-controlled, association-based approach. In such studies, the prevalence of alleles in single-nucleotide polymorphisms (SNPs) in biologically important candidate genes is examined in populations of unrelated affected individuals, and compared with prevalence in unrelated normal controls. Very few studies have examined the genetic components predisposing to ILDs and, of these, most have focused on the region of chromosome 6, which incorporates the major histocompatibility complex (MHC) and its associated genes. The consensus from the majority of the studies is that susceptibility to sarcoidosis is associated with HLA-DRB1*03, *11, *12, *13, *14. Other associations include alleles in the genes encoding TAP2, the CC chemokine receptor 2, the angiotensin-converting enzyme and vitamin D receptor . Polymorphisms in the fibronectin gene  and the HLA-DPB1*1301 allele  have been associated with fibrosing alveolitis in the context of systemic sclerosis. Susceptibility to IPF has not been associated with polymorphisms in TNFα, LTα, TNF receptor II and IL-6 genes , nor with polymorphisms in the IL-8 and IL-8 receptor (CXCR-1 and CXCR-2) genes . A reported association with the IL-1 receptor-antagonist gene  was not confirmed in a subsequent study. The genes for the hydrophilic proteins SP-A1, SP-A2 and SP-D have been mapped to human chromosome 10q22-q23.1. The SP-A1 gene is telomeric to the SP-A2 and SP-D genes: the SP-A2 and SP-D genes are located 36 kb and 130 kb respectively from SP-A1. Both SP-A1 and SP-A2 genes have a number of 5'-untranslated region exons that splice under genetic control in different configurations to produce a number of alternatively spliced functional variants . Furthermore, there are a number of polymorphisms within the coding region of the genes that result in amino acid substitutions . In the SP-A1 gene there are five exonic polymorphisms, which correspond to amino acid (aa) positions 19, 50, 62, 133 and 219 of the protein. Two of these are silent (62 and 133), while the others result in a non-conservative amino acid substitution (Ala19→Val, Leu50→Val and Arg219→Trp). In the SP-A2 gene, there are four exonic polymorphisms (Thr9→Asn, Pro91→Ala and Lys223→Gln); the polymorphism at position 140 is silent. Nineteen haplotypes have been identified in the SP-A1 gene (designated 6A to 6A20), and 15 haplotypes have been identified in the SP-A2 gene (designated 1A to 1A13) . Of these haplotypes, the most frequent are the SP-A1 (6A2) and SP-A2 (1A0) haplotypes. These two haplotypes comprise the following amino acids: SP-A1 (6A2: Val19/Val50/Arg219) and SP-A2 (1A0: Asn9/Ala91/Gln223). In functional studies, these haplo-types correlated with low or moderate mRNA levels . In the SP-D gene there are two exonic polymorphisms that result in substitutions: Thr11→Met and Thr160→Ala . Genes mapped to human chromosomes 2p12-p11.2 and 8p21 encode the hydrophobic proteins SP-B and SP-C respectively. Several SNPs have been identified in the SP-B gene. Four of these polymorphisms, which reside in the 5' flanking region, intron 2, exon 4 and 3' untranslated regions of the gene, have the potential to affect function . The exonic polymorphism substitutes residue 131 (Thr→Ile). There is also a variable nucleotide tandem repeat region, which is highly polymorphic, within intron 4 of the SP-B gene . For the SP-C gene, there may be several SNPs as there are a number of variations between published SP-C sequences . Figure 1 shows the intron/exon structure of the SP genes with the locations of polymorphisms discussed above. The figure shows the location of the surfactant gene polymorphisms. Exons are represented by black boxes and introns by straight lines (drawn to scale). The numbers refer to the positions of the amino acids in the proteins, as discussed in the text. Chr, chromosome; UTR, untranslated repeat. A locus is considered polymorphic if the less frequent allele has a population frequency of at least 1% and heterozygosity frequency of at least 2%. Below these frequencies, nucleotide variations are allelic variants or, if very rare, they are described as mutations . A number of mutations have been identified in association with hereditary surfactant deficiencies. The predominant, but not exclusive, mutation responsible for SP-B deficiency involves a substitution of a GAA nucleotide triplet for a single C in codon 121, which causes a frameshift and a premature termination signal and also interferes with SP-C processing . Mutations in the SP-B gene are also responsible for SP-B deficiency in congenital alveolar proteinosis . Until the recent work published by Nogee et al., there were no data on SP-C mutations and lung disease. Nogee et al. recently reported an association between a mutation in the SP-C gene and ILD. A full-term baby was born to a woman with a history of desquamative interstitial pneumonia, which was diagnosed when she was one year old and had been treated with corticosteroids up to the age of 15. The baby was normal at birth but developed respiratory symptoms at six weeks of age. Lung biopsy revealed cellular, or non-specific, interstitial pneumonia. The infant improved with oxygen and corticosteroid therapy. The mother's lung disease worsened and she died of respiratory failure. Genetic analysis showed a mutation in one allele of the SP-C gene. 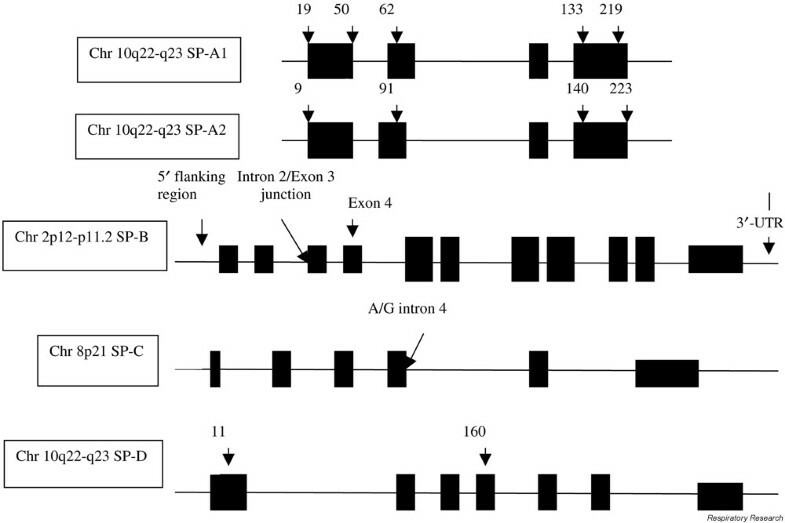 The heterozygous substitution of A to G was located in the first base of intron 4, abolishing the normal donor splice site and resulting in the skipping of exon 4 and the deletion of 37 amino acid residues in the SP-C precursor protein. Abnormal protein structure is known to result in abnormal tertiary structure and transport. Mature SP-C was completely absent from the BAL fluid and lung tissue of the patient and might have resulted from this aberrant folding and transport. The complete absence of protein with the mutation of a single allele is possibly due to a dominant-negative effect, in which the mutant allele suppresses production of the normal allele . The authors subsequently studied the SP-C gene in 34 infants with nonfamilial chronic lung disease of unknown origin (Nogee et al., personal communication, 2001). They were able to identify mutations of the SP-C gene in 11 infants, which resulted in a phenotype similar to that of the index patient. The occurrence of a de novo mutation that is functionally identical to a familial mutation strongly supports the hypothesis that the mutations were causally related to the lung disease. This suggests that SP-C is necessary for normal lung function in the postnatal period. No other studies have examined surfactant-gene polymorphisms in the context of ILDs, although these have been evaluated in other pulmonary conditions. In a recent publication , the SP-B Thr131→Ile polymorphism was found to be associated with the acute respiratory distress syndrome. Alleles in the SP-B variable nucleotide tandem repeat region and SP-A polymorphisms have been reported to be associated with the infant respiratory distress syndrome [21, 28], but more recent data suggest that genetic susceptibility to infant respiratory distress syndrome is dependent on SP-A alleles in the context of SP-B Thr131 homozygosity . The SP-A1 polymorphism 6A6 is also over-represented in infants with bronchopulmonary dysplasia . In summary, genetic variations are factors in determining the development and severity of many ILDs. Surfactant plays an important role in lung physiology and defense, and surfactant gene variations have been associated with several lung diseases. The recent finding of surfactant gene variations in familial and nonfamilial ILD opens up a new area for more detailed analysis, to explore whether these variations play a role in a wider range of ILDs.